A vehicle wheelchair lift may be the perfect solution for people who need a mobility solution but may not yet be ready to commit to a wheelchair accessible vehicle. For those curious about choosing a wheelchair lift for their full-sized van, we interviewed our regional lift specialist. Tom Thomas, Senior Inside Sales Coordinator, has been with BraunAbility for 18 years. He's the expert when it comes to lifts and can prescribe a lift for a customer just over a phone call. According to Tom, the two biggest considerations to make when deciding on a liftis the amount of interior space you are willing to give up to make room for the lift and an accurate assessment of your physical capabilities. "If it's going to be an instance where there's an independent driver, we typically go with the Millennium SeriesTM lift," Tom said. "That's because there's a side-entry feature on that particular lift so if someone at Walmart parks too close, they still have an opportunity to get on the lift." 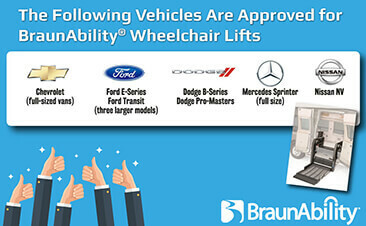 BraunAbility offers three lifts for consumer use, the Millennium Series, the Century SeriesTM, and the Under Vehicle Lift® (UVL®). Each has slightly different applications and price ranges, and a BraunAbility consultant is your ticket to finding the best lift for your needs. You may want to try before you buy, but some consultants don't have lifts in their showrooms. Not to worry, that's what our network is for! If you ask, our consultants can contact other BraunAbility locations to find the lift you want to see. More likely, our consultants will contact BraunAbility customers who can operate their lift to the curious buyer. "Depending on the vehicles and the scenarios and what a customer wants, there can be numerous amounts of products that they can use," Tom said. Some of the considerations customers will need to ponder are if they want power doors or a remote to operate the lift. As always, it's your local BraunAbility dealer who can answer your questions the best, and if you are even considering a lift, a visit should be in order!